Set up by Pranee and Andy Laurillard from a tiny fisherman’s cottage in Brighton back in 2002, Giggling Squid began with a simple idea: to cook ‘simple, rustic, fresh Thai food’ where the emphasis is on sharing. They were on to something. 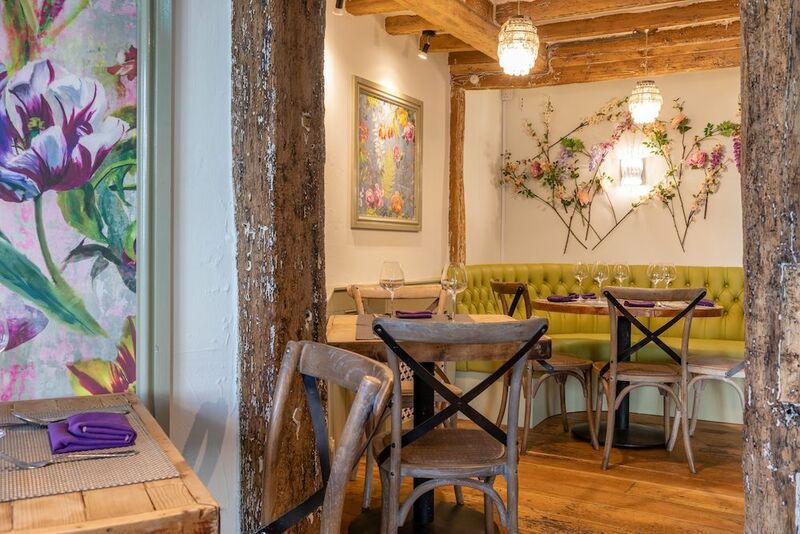 That Brighton cottage is now their restaurant and there are a further 29 sites across the country including Henley (my destination for this review), Marlow (see our review here), Beaconsfield and Windsor with another in Oxford due to open soon. While other chain restaurants are shutting up shop, Giggling Squid is spreading its tentacles far and wide, as it brings inventive Thai tapas to the nation. 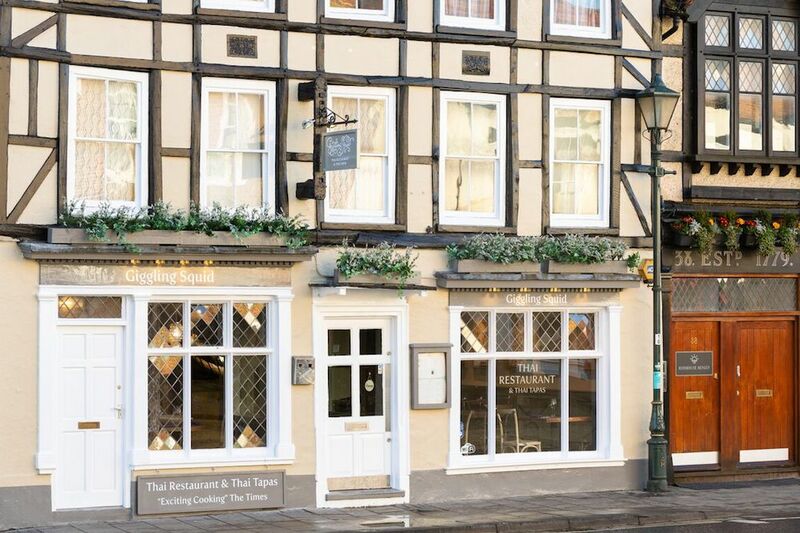 Its Henley outpost was fresh from its facelift in January when I visited and, my, doesn’t it look pretty? 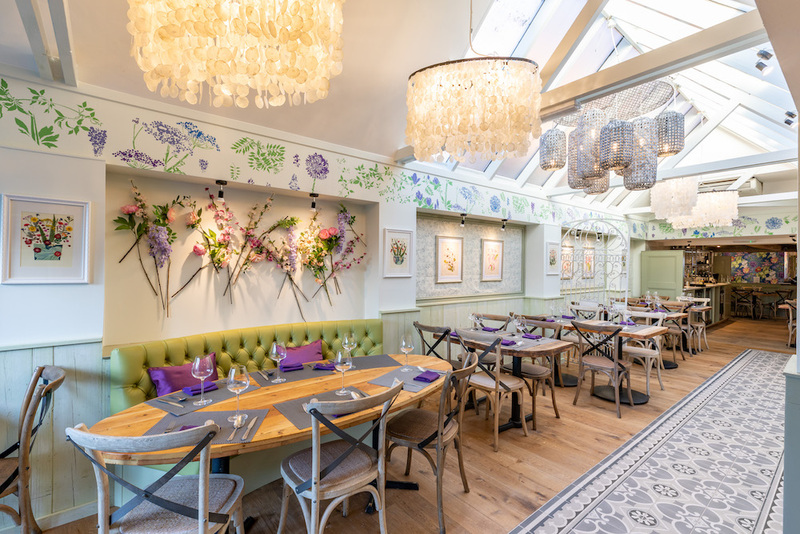 Light and bright with murals of wisteria stencilled on the walls, along with artful collections of faux flowers, it feels feminine and original. The pistachio green leather banquettes and pops of purple bring it in line with its other branches. It’s refreshing to see a restaurant doing something creative with its interiors rather than just applying the cookie-cutter standard issue ‘greige’. All the Giggling Squid restaurants are housed in quirky buildings, and the Henley one is a beauty – exposed beams are given a modern update with the beautiful glass-roofed extension. We were warmly welcomed by the staff when we arrived, who were attentive and knowledgeable and gave great recommendations. It being a Friday night, there was a buzzy atmosphere, as tables of couples and groups of friends gathered to toast the end of the week and share a good meal. There’s a great drinks menu here but I ordered a medicinal glass of Prosecco – and was very amused by the lovely personal messages on the menu. The ‘Instinct’ Premier Cru, at £49.95 a bottle, “is a very special, posh Champagne, if you are rich.” My husband was delighted with his Buddha-shaped green bottle of Lucky Buddha lager. There are some excellent-sounding cocktails on the menu too, including a new Strawberry Mojito. The Thai tapas menu is reserved for lunch, and for dinner it’s a more traditional menu of starters and mains but you’ll be hard pressed to choose just one dish each. It’s so hard, in fact, that my husband and I ordered three starters along with some crisp, spicy prawn crackers. The Lime and Chilli Beef is new on the menu and was a big hit with us both. 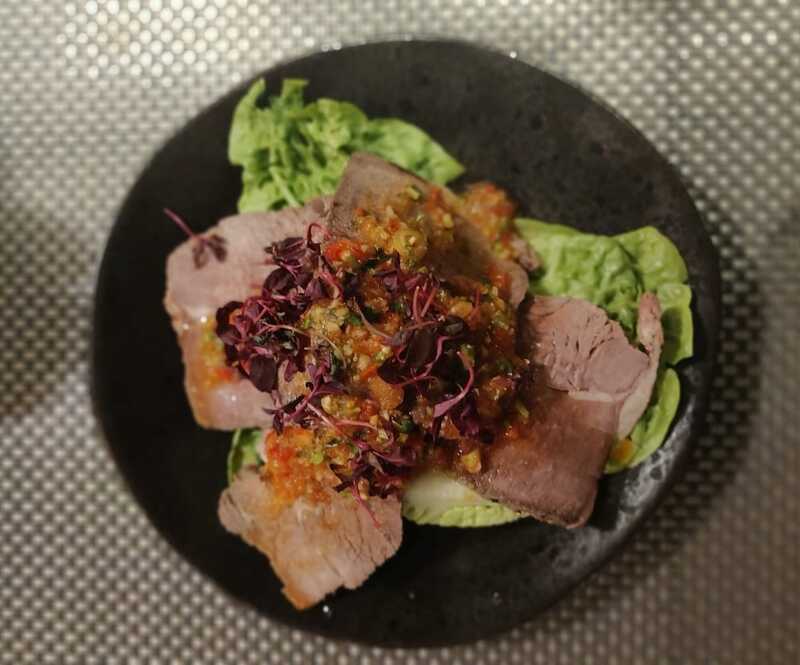 Thinly sliced, medium rare cold roast beef is served with a fresh, zingy dressing with herbs and crunchy baby gem lettuce. The Papaya Salad is served the Bangkok way, without the pickled raw fish they serve it with originally in Northern Thailand, but the chefs are very happy to make it that way if you’d prefer. Fresh shredded papaya is mixed with a spicy dressing – although it says ‘lightly spiced’ this definitely one for those who like their food hot. We couldn’t possibly resist the Giggling Squid’s classic Salt and Pepper Squid: hot and fluffy, we scoffed these as quickly as the rooves of our mouths would let us. When it comes to main courses, the usual go-tos of green curry and Pad Thai are of course on the menu, but Giggling Squid regularly freshens things up with inventive new dishes to encourage diners to step outside of their comfort zone. 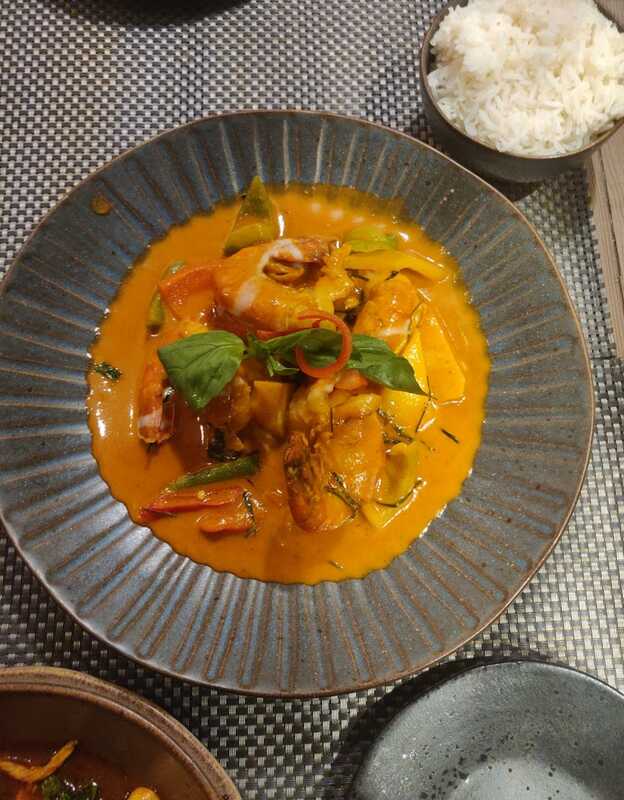 After much deliberation, I opted for the Koong Chu Chi – the biggest, juiciest prawns I’ve had in years, butterflied and cooked in a rich, spicy red curry sauce. This was a truly outstanding dish and one I’ll be sure to pick again. I ordered some gorgeously glutinous sticky rice to go with it, while my husband went for the Chicken Stir Fry Pak Maew with coconut rice. 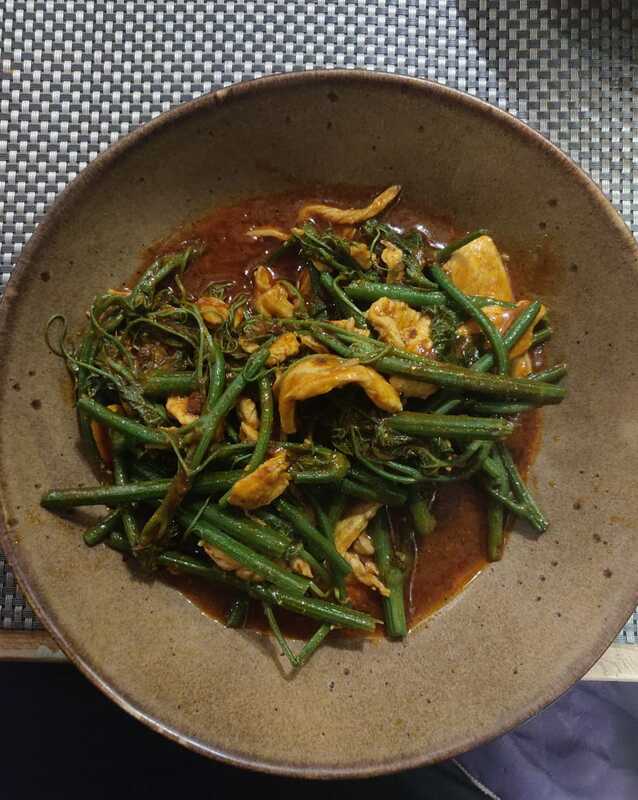 Pak Maew is a delicious, leafy green vegetable that was just made for stir fries, and the turmeric and red curry paste gave this dish a complex flavour. Both dishes complemented each other really well as, of course, we shared. While Thailand might not be known for its puds, dinner isn’t finished for me without a sweet little something to round it off. 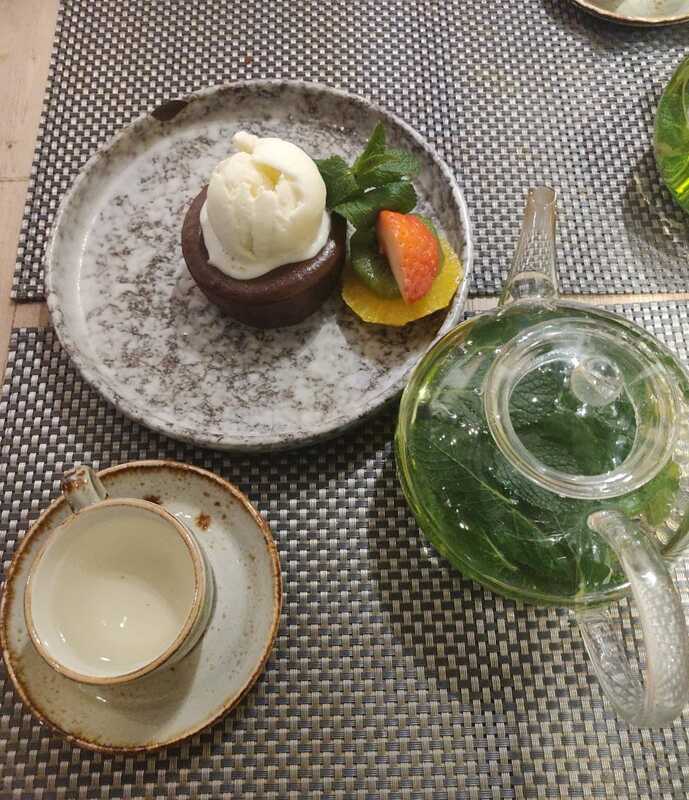 There were some lovely options, including a caramelised mango cake, Prosecco-and-muddled-berry cheesecake, and jasmine and toasted rice ice cream. I’m a fully paid-up chocoholic so my husband and I shared the molten chocolate dessert with vanilla ice cream. Sweet and gooey, it was completely delicious but even I couldn’t manage a whole one. 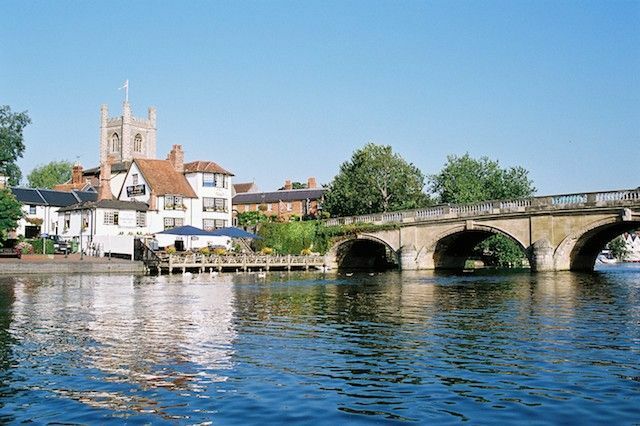 Home to the famous regatta and the brilliant literary festival, Henley is a vibrant town with plenty going on. Looking for retail therapy? 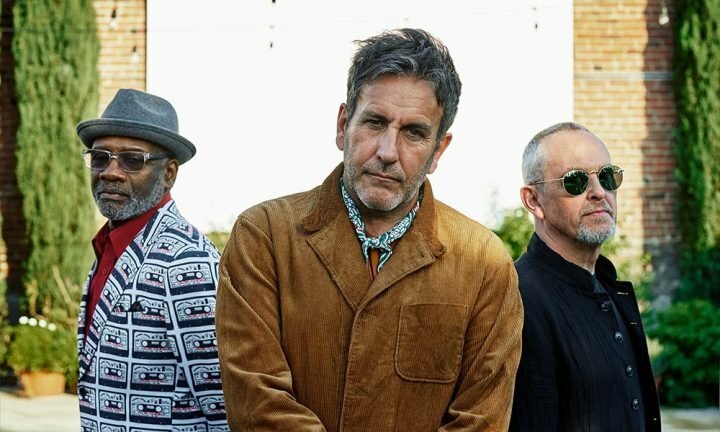 Fluidity on Bell Street is the place to go for designer labels, while the outposts of Joules, Mint Velvet and Moda in Pelle on Falaise Square are standard Home County town options while The Bell Book Shop on Bell Street is a great indie for literature lovers. Also worth mentioning the River & Rowing Museum which has the best position in Henley bang on the river, and often has excellent family-friendly art exhibitions (everything from David Hockney to Barbara Hepworth). You’re close to the National Trust-owned Greys Court too – the bluebells in Spring are extraordinary. Good for: Couples, friends and groups, Giggling Squid offers stand-out, authentic Thai food in cosy comfort for anyone who loves Asian food and wants to try something new. 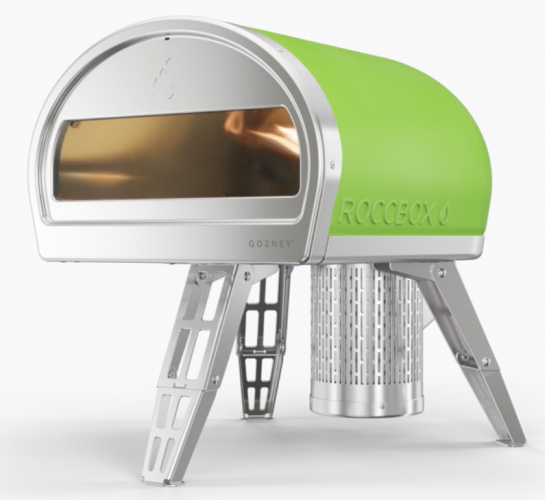 There are plenty of great veggie, vegan and gluten-free options, too. 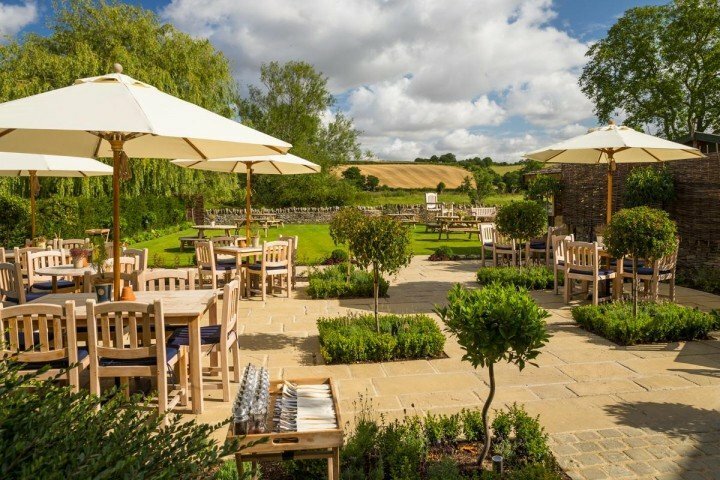 Not for: Very young or fussy children – there is a great little children’s menu of scaled down classics like Pad Thai and Chicken Satay but you won’t find pesto pasta or fish fingers here (hurrah!). The damage: I think it’s good value. The starters came in at £7.25 each (fairly average) and the Koong Chu Chi was £14.95 – great value considering the number and size of the prawns. The stir fry was a bargainous £9.95 and desserts are all £5.95. A glass of Prosecco is a reasonable £5.45 and the Buddha beer is £4.50 a bottle. 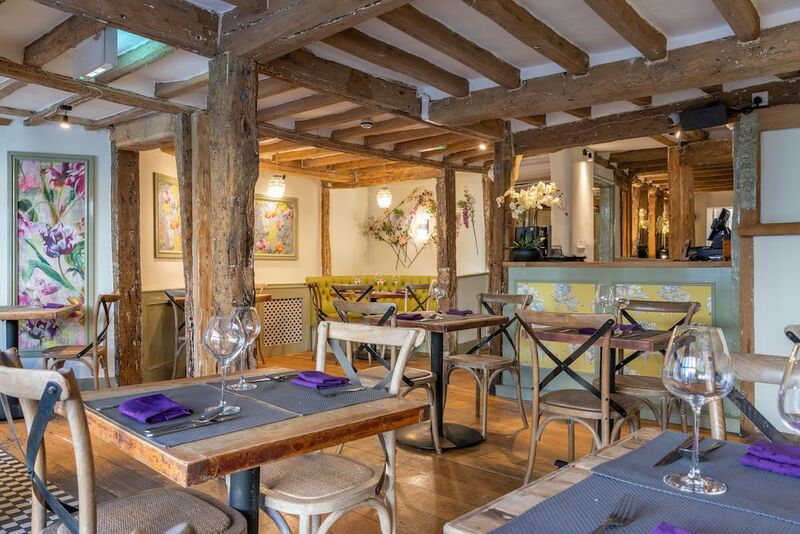 Giggling Squid, 40 Hart St, Henley-on-Thames RG9 2AU. Tel: 01491 411044.